US Rock 'n' Roll singer born Oscar James Delbridge, on 6 March 1937 in New Lothrop (Michigan). 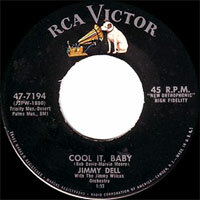 Jimmy Dell was an unlikely candidate for a rock 'n' roll star. As a child he had to overcome difficulties with speech (stuttering), poor eyesight, a low self-image, poverty and the tragic loss of his dad at an early age. Two things kept him going : music and religion. But sometimes the two would clash. Born on a farm in Michigan, Jimmy Delbridge moved to Coolidge, Arizona in 1946 with his family. In 1954, at Coolidge High School, he met Duane Eddy who shared his love of music. Both played guitar and sang and soon they were performing on local radio (KCKY) as Jimmy and Duane. Jimmy was the better singer, Duane the better guitarist. At Duane's suggestion, Jimmy switched to piano. By 1955 local disc jockey Lee Hazlewood had become their loosely aligned manager. In June of that year Hazlewood took the boys into Ramsey Recording Studio in Phoenix to record two of his earliest compositions, "Soda Fountain Girl" and "I Want Some Lovin' Baby", backed by Buddy Long & the Western Melody Boys. Custom-pressed by Four Star Records in Pasadena, the single appeared on a one-off logo jokingly named after Hazlewood's radio alter ego, Eb X. Preston. Both sides were old-fashioned hillbilly and did not foreshadow in any way what lay in store for Duane Eddy. Not many folks outside the Phoenix - Coolidge region bought a copy. In February 1956, Jimmy and Duane made their debut on The Arizona Hayride (a country dance broadcast once a week by KRUX in Phoenix). It was there that Eddy, Hazlewood and also, to some extent, Delbridge made the contacts that would influence their further musical career : local musicians like Al Casey and his guitar-playing wife Vivian (professionally known as Corki Casey), drummer Connie Conway and jack-of-all trades Donnie Owens. Jimmy fell in with the new rock 'n' roll sound, but struggled with his religious convictions. One evening he would play secular music with enthusiasm, the next night he would tell Duane that he couldn't sing with him anymore. This swung back and forth for some time, until Duane got fed up and decided to annul their partnership in the autumn of 1956. He went on to become a major star, but Jimmy's musical career wasn't over either. He would frequently slide back into the temptations of secular music. Allegedly, Jimmy plays piano on Duane's first solo single, "Movin' 'n' Groovin'"/"Up And Down", but you need a pair of very good ears to detect a pianist on those two tracks. On November 11, 1957, Jimmy signed a recording contract with Rev Records, owned by Floyd Ramsey, who also became his manager. Four songs were recorded on December 8, 1957 at Ramsey's Recording Studio in Phoenix. The backing was supplied by what John P. Dixon (the expert on Arizona rock 'n' roll) has called the Arizona A-Team, which included Al Casey (guitar), Corky Casey (rhythm guitar), Jimmy Wilcox (bass), Bob Taylor or Jimmy Troxel (drums), Howard Crook (piano) and two saxophone players, Darrel Macey and Ronnie Luplow. 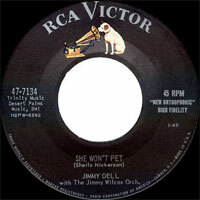 From this first session, "Teeny Weeny" and "She Won't Pet" were released as a single, but it did not come out on Rev, but on a major label, RCA Victor, as part as an already established deal between RCA and Trinity Publishing in NYC, the financier of Rev Records. 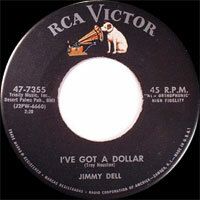 RCA renamed him Jimmy Dell and released three singles by him in 1958. The best of these are "Teeny Weeny" (also issued in the UK on RCA 1066, but with a different flipside, "Barbara Jean" by Barry DeVorzon) and "I've Got A Dollar", but most of the other Phoenix-recorded tracks are also worthwhile. Jimmy sounds confident on these rock 'n' roll recordings and the backing by Arizona's A-Team is a definite plus. It was the usual story, however, with little airplay and few sales. Jimmy moved to Phoenix in 1958. He joined the "Biggest Show Of Stars Of 1958" tour, which featured the Everly Brothers, Paul Anka, Sam Cooke, The Monotones, Jackie Wilson, The Crescendos, Jimmie Rodgers and George Hamilton IV, among others. RCA dropped him at the end of his three-year contract. 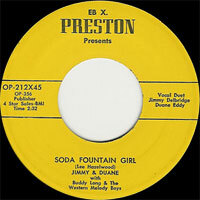 Between 1958 and 1962, Jimmy sang and played piano in Buddy Long's Phoenix group. He would return to the studio in July 1962 for an instrumental single ("Skippin'"/"Sweet Potatoes") on the Philips label, which has Jimmy playing the organ. 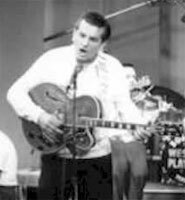 Finally, in June 2009, he returned to the rock 'n' roll stage, with a performance at the 13th Rockabilly Rave Festival at Camber Sands, East Sussex, England. His set was short, barely 25 minutes, but went down well. At YouTube you can see him doing "I've Got A Dollar" and "Rainbow Doll"